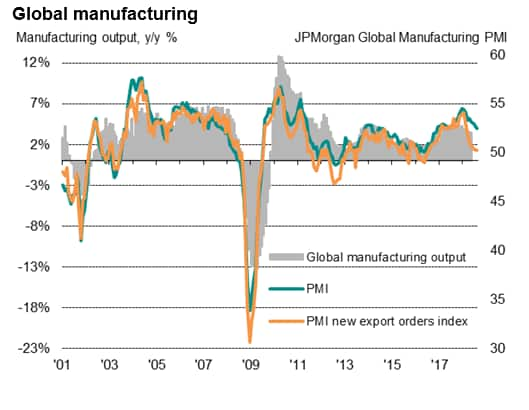 Worldwide manufacturers reported the weakest expansion since November 2016, with near-stagnant exports continuing to act as a drag on production and employment in August. The JPMorgan Global Manufacturing PMI™, compiled by IHS Markit, fell from 52.8 in July to 52.5 in August, its lowest since November 2016. The decline represents a continuation of the slowdown that has been evident since the PMI peaked in December of last year. Employment growth meanwhile slipped to the lowest since July of last year as firms cut back on hiring amid gloomier prospects: business optimism sank to a 22-month low during the month. The slowdown has been driven by waning order book growth, which slid to a two-year low in August. This reduced flow of new business in turn reflected an on-going near-stagnation of new export orders. Global export orders have shown only marginal growth in each of the past four months, indicating a marked pullback in trade since the near-seven-year high seen at the start of the year. The deteriorating trade pattern has accompanied a darkening picture of global trade politics, with survey responses commonly citing tariffs and escalating trade wars as a key factor behind worsening production, exports flows and future sentiment. With the US-China trade spat in full swing, both countries saw export trends continue to run markedly weaker than earlier in the year. China's export orders fell for a fifth straight month, albeit to a slightly lesser degree than July, while US export orders were broadly stagnant following two months of marginal decline. 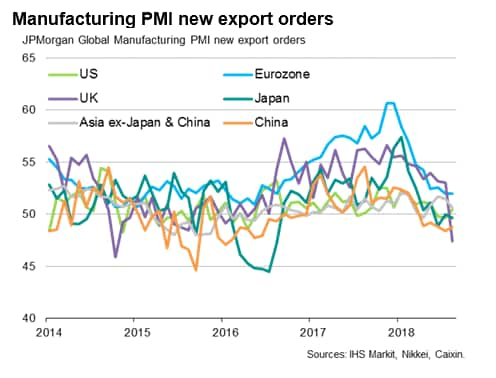 The downturn in China's exports brought the Caixin headline PMI for China down to a 13-month low, while the US PMI edged down to a five-month low. The UK was notable in seeing the third-largest export decline of all countries surveyed, making it the worst-performing developed country. Companies cited Brexit worries as having exacerbated the wider global trade slowdown. UK exports fell at the fastest rate since October 2014. The drop in UK exports was all the more surprising given the fillip of a weak trade-weighted exchange rate and steady solid growth in the UK's largest export market, the Eurozone. In fact, if the Eurozone was counted as a single country, it would have led the global export rankings, with the Netherlands, Ireland and Greece reporting especially strong performances. 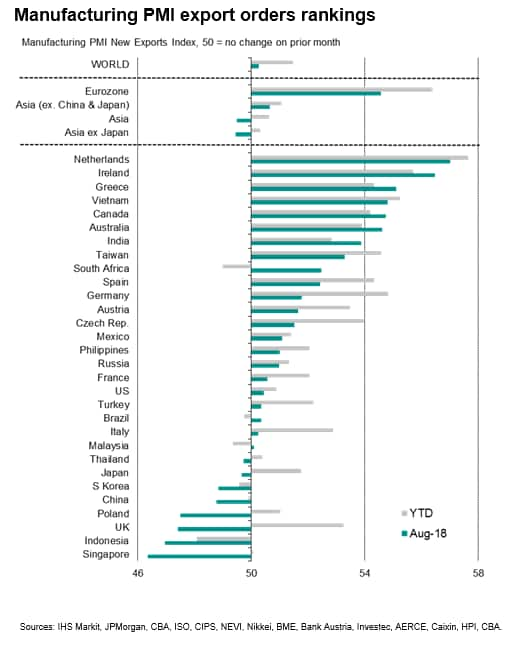 In all, eight of the 30 nations covered by the IHS Markit manufacturing PMI surveys reported a fall in new export orders in August, with the steepest decline seen in Singapore, followed by Indonesia. Poland, South Korea, Japan and Thailand also suffered falling exports, alongside the aforementioned declines in the UK and China.